In August, we purchased a drone. Our team designed a digital “Drone” badge that faculty members could earn in pre-planning. We unleashed the drone in chapel for all students to be introduced to our newest interactive tech device. In September, we crashed the drone. While Upper School students were learning how to make minor repairs to the drone, we purchased an additional drone. In October, Mr. Roth took small groups of students outside to learn how to pilot the drone and discuss related science and ethical issues. In November, I worked with a small, volunteer group of students on e-portfolios and badge design. Part of our exploration included flying the drone. In a November social studies R & D meeting, a small group of teachers flew the drone and imagined ways to implement the technology in their classrooms and connect it to their learning outcomes. In December, we temporarily grounded the drones to make sure we are in compliance with all FAA laws and regulations. We hope to be back in the air very soon. All 6th grade science students learned how to fly the drone outdoors in small groups which included a series of questions and discussion about the ethical decision making issues related to this technology. A group of five 8th grade students (who volunteered and are working with me to make eportfolios more relevant for students) earned their drone badge while learning how to use the Go Pro to capture and upload videos from flight to their eportfolios (they also learned about the 6 parts of badge design and have designed their own badge prototypes). I love these kids! On a later date, I took some of the boys who requested a chance to earn the badge outside for a flight. One of the boys received the same drone for Christmas and has since brought his personal drone to school and is showing other students how to use it at recess. 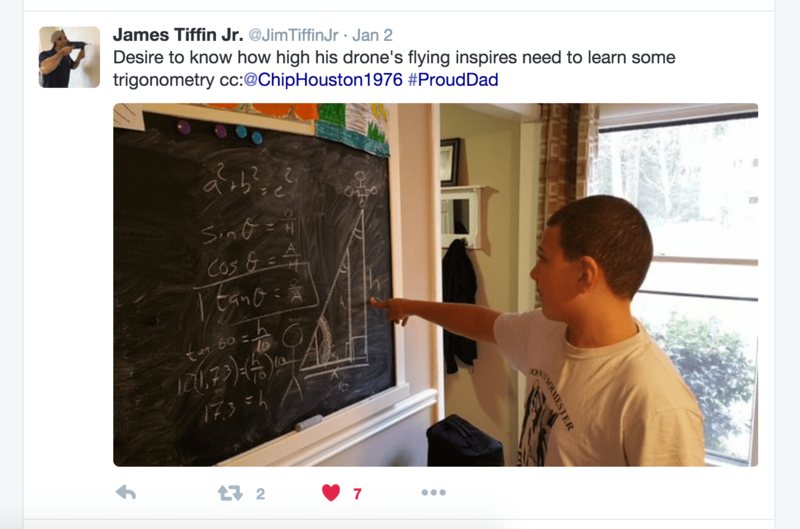 Mr. Tiffin posted a home, trigonometry lesson (#FSBL style) inspired by our drone flight. Over Thanksgiving, I brought the drone home to learn a bit more and taught my oldest son how to fly the drone and capture video. This article is compelling because the drones beings used by the elementary students are smaller and primarily used indoors compared to the drones we use which are a primarily outdoors and of a professional grade. It involves coding and ipads. Very cool! Easy to implement, safer, and accessible. FAA rules establish three classifications of UAS operations: 1) Public UAS in which a government entity such as a law enforcement agency, a fire department, a border patrol agency, a disaster relief operation, or a search and rescue organization may obtain a Certificate of Authorization (COA) to use a drone; 2) Civil UAS in which a commercial entity may obtain a Special Airworthiness Certificate (SAC) to use a drone for business purposes; and 3) Model Aircraft in which the use of an UAS is permitted for recreational purposes if certain criteria are satisfied by the operator of a drone. The key issue regarding the use of drones by high school sports teams is whether the use of small UAS fit into the FAA’s Model Aircraft classification. What would you like to see our students do next? What ideas can you share?